What has often been translated as ‘ancestor worship’ may be more helpfully be called ‘veneration’. The use of the word ‘worship’ immediately makes it sound more religious than it actually is. The belief is not associated with any particular Chinese religion, indeed it has remained the unchanging bedrock of Chinese tradition. Veneration of ancestors can be traced back to the rituals carried out by the dynastic rulers as far back as the Shang dynasty 3,500 years ago. Ancient Shang tombs have been found with ceramic vessels of food left for the dead. The ancient characters found on Shang 'oracle bones' confirm the widespread rituals associated with the ancestors. The Chinese classic, the 'Book of Songs' describes elaborate and emotional rituals dating from the following Zhou dynasty. The ancient belief is that people have two spirits the 魄 pò provides a person's physical body while the 魂 hún is the personality and the immortal soul. Both aspects have to be properly handled after death. The hun is destroyed by cremation and that is why bodies were for centuries buried and not burned. Other spirits are the 神 shén which are helpful (ancestors of the male line) and the evil spirits 鬼 guǐ which are often malevolent. Ancestor veneration is based on a long held belief that the ancestral spirits are monitoring the lives of their living descendents from the after-life; and so the ancestors are informed of all important events in the family, especially marriages. The souls of the departed are believed to have the power to bring retribution upon the living, and so the appropriate offerings must be provided to keep them content. Importantly only men could perform the rites and this led to a higher value placed on sons rather than daughters. Without a son there was no-one to venerate the ancestors and their spirits would then bring misfortune on the remaining family. The duty went both ways, if ancestors had failed in their duty to their descendents during their lives, by for instance not maintaining the land, they could be removed from the shrine and lost from the lineage. At least twice a year the family would visit the ancestral graveyard, burn incense sticks and leave food and presents. Often the family would have an ancestral hall that has tablets listing all members of the extended clan or family. The ceremonies are led by the clan elders who pass on family traditions and make the key decisions for the family. 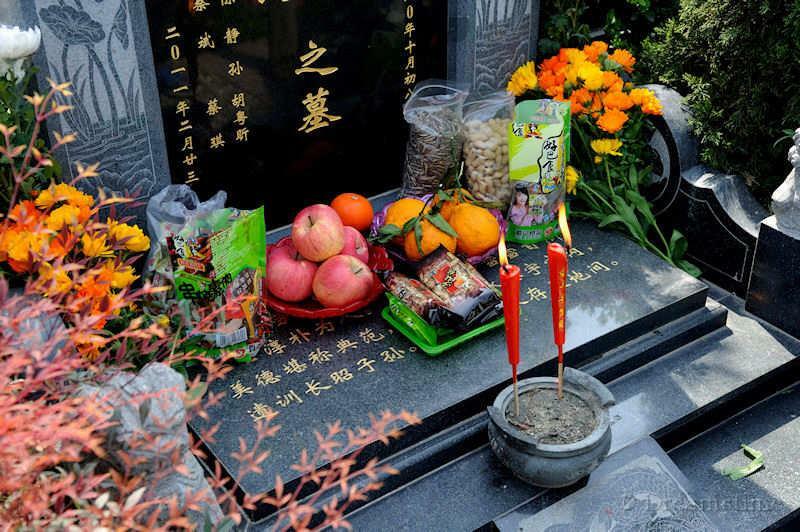 The most important times to visit the graveyard are at Qingming festival in April and then Hungry Ghost Day in August. At Chinese New Year many Chinese people travel back to their ancestral home village which has the ancestral burial ground. An ancestral tablet bears the names of the ancestors. Often a parcel of 'ancestral' land gave income that was used to pay for the maintenance of the shrine and the offerings. For many people long ago, all the villagers were related and bore the same surname. The veneration of ancestors was then a communal act of solidarity and confirmation of shared heritage. Tradition has it that a part of the deceased spirit is locked in the ancestral tablet. Sometimes chicken blood was offered as sustenance to the spirit locked inside it. Traditionally, every home will have a shrine dedicated to the family's ancestors. A small ancestral shrine is usually placed on the north wall of every house with incense burners around it. A mother's name is added to the inscribed list on the tablet alongside the father on her death. As it was so important to have your name inscribed on a tablet, a problem arose on the death of unmarried daughters as there was no place alongside a man on the tablet for their names to be added. Sometimes a special marriage with an unmarried, single, dead man was arranged so her name could be put on his family's tablet. Sometimes a marriage was made to a bachelor on the agreement that he would, after a brief period of mourning, marry another daughter of the same family. If these options were not possible, the unmarried daughter could pay to have her name to be added to a special tablet at a Buddhist temple. Respect for ancestors is deeply enshrined in Confucian writings and the belief has its strongest roots in Confucianism. The rules of filial piety require that a son must honor and obey his father in all things even after death. It remained as the common shared belief even if someone believed in Buddhism, Daoism, Christianity or Islam. The veneration of ancestors gave the Jesuits problems when they brought Christianity to China. The strong belief in the need to venerate the ancestors is not really compatible with Christian doctrine. The missionaries decided to try to accommodate the belief within an adapted form; however the Pope in 1707 ➚ did not accept this compromise and the numbers of Chinese Christian soon dwindled. Citation information for this page : Chinasage, 'Ancestor worship and veneration in China', last updated 23 Oct 2017, Web, http://www.chinasage.info/ancestors.htm.